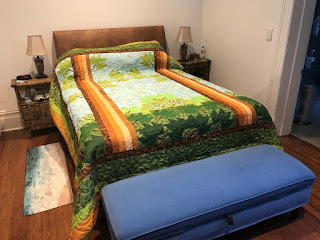 I Quilt, Therefore I Am: Quilt 11: Trees - DONE! Quilt 11: Trees - DONE! 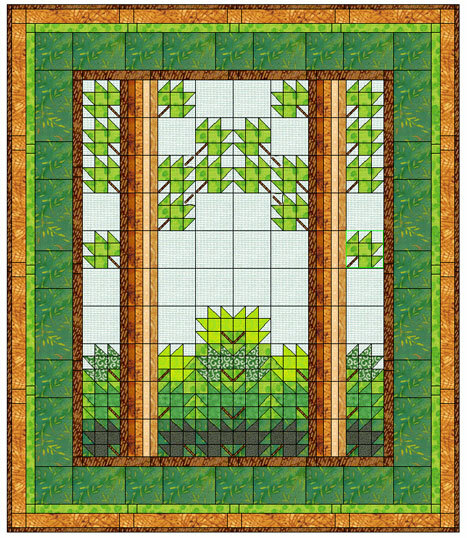 I started it in 2011, a design I put together using "leaf" blocks. I got the top put together, but then got distracted by other projects and ended setting it aside until just recently. And here's the finished quilt, laying on the bed. The forest image just doesn't show up well like this. 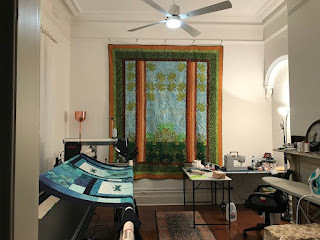 But I decided to hang it on the wall of my "quilting room" - and it's spectacular there! For batting, I just grabbed leftover bits and pieces from other projects and hand-stitched them together. It took a little time, but I used up a LOT of leftovers and you'd never know where the joins are; the quilting hides them beautifully. The quilt stitching was done on the longarm using the "Nested C's" pattern I've been experimenting with. It only took 3 hours to quilt it! Amazing! I'm especially pleased to have this on the wall of my "quilting room". There's no carpeting in there (just a carpet runner I stand on in front of the quilt machine), so having the quilt on the wall gives a little bit of noise-reduction. Jenny's 3D "North Star" Quilt - Fabulous! Quilt 106 - Flower Panel - DONE! Quilt Yarn & Sew (where I bought my longarm). It's a charming little shop in North Wandin. Nice fabric selection, loads of gadgets and doo-dads, and the customer service is outstanding. Quilt Kisses - 200+ fabulous quilts! 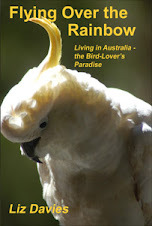 Machine Quilting Business - loads of useful articles. "Still Flying Over the Rainbow"
Fabric=Yes/Design=No -"Hawaiian Bird of Paradise"
Fabric=Yes/Design=No - "Surfboards and Ukeleles"
Quilt 60: Double Square Star - DONE!